I can’t remember the last time I bought my lunch downtown when I was at work. It’s definitely a rare thing and if I tried to think really hard, I’d guess it was last summer when I was on the Slow Carb diet and I needed some non-carb food to add to my salad because I was famished. I think I bought some chicken from a Greek food cart. The memory is foggy because it really is a rare thing to splurge on. For one, I don’t want to use the calories. Second, it’s too expensive to eat out for lunch! With Michael being home unemployed right now I thought it would be a nice thing for us to get together for a lunch date. About once a week I have an hour lunch and we made a date. Michael came downtown and picked me up from the office and we walked over to Sizzle Pie for lunch. 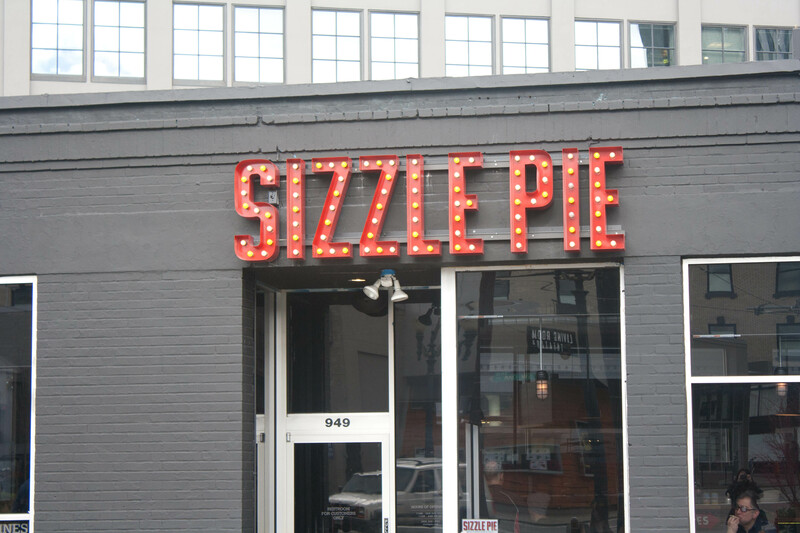 Sizzle Pie is a pizza joint in the old Rocco’s Pizza across the street from Powell’s Books. 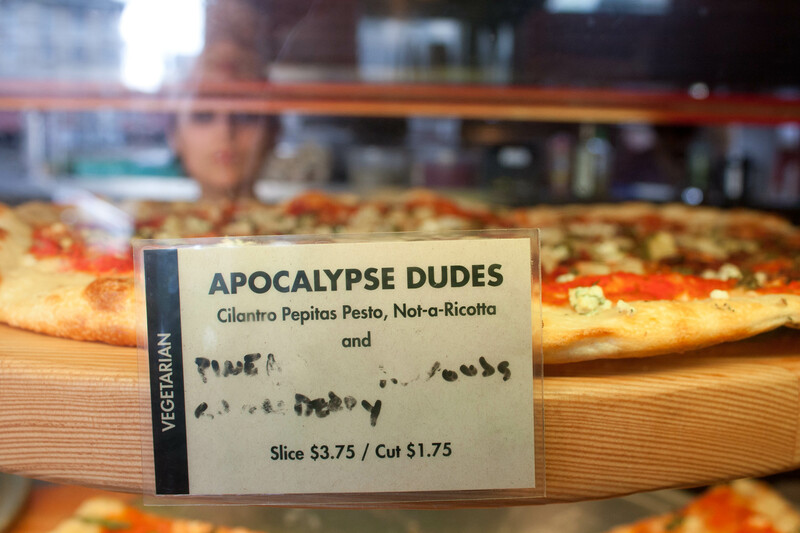 Apparently the pizzas are named after metal bands but I have no idea about that! The walls were painted a flat black and the jukebox in the corner was playing music you wouldn’t normally hear in a restaurant but it was a cool vibe. I got the Ol’ Dirty pizza. It was a pizza with ricotta, truffle oil (my new favorite thing), a few slices of salami and pepperoncinis. 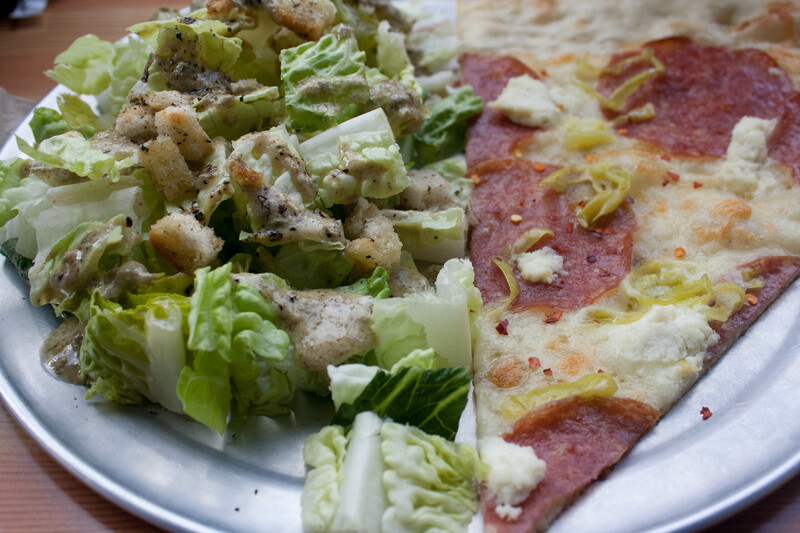 I got the lunch special–a slice and a salad. I definitely could have survived on just the slice but the salad just sounded really good to me. And I was glad I got it. 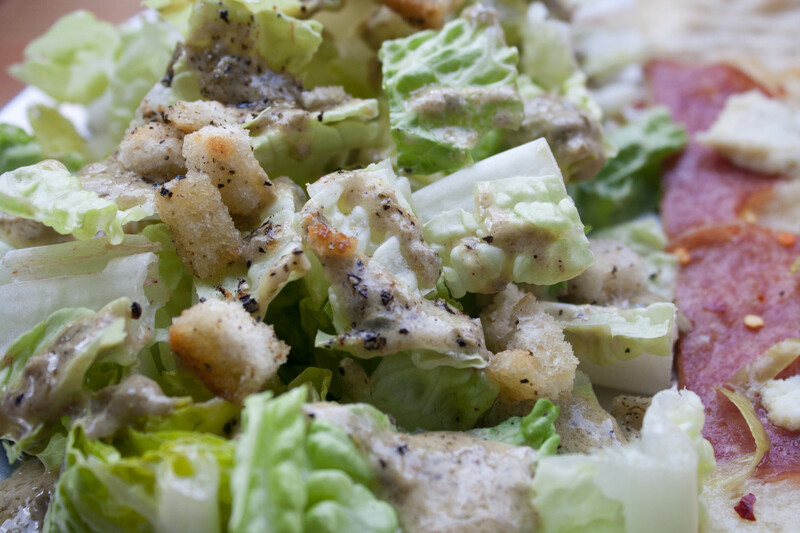 I ordered the “Caligula” Caesar salad with vegan dressing. I’m not vegan, but I LOVED the salad dressing. It was so tasty! We sat at the bar facing the street and chatted while we ate our slices and sipped our Coke Zeros. 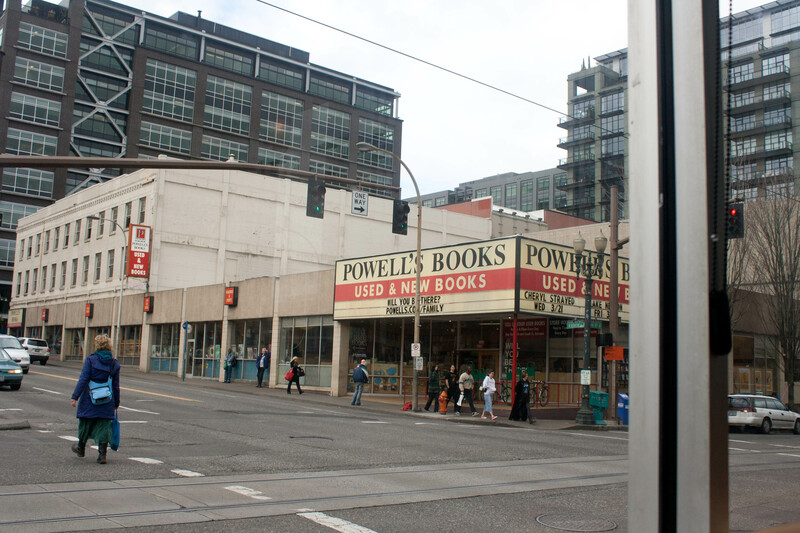 The corner is super busy–10th and Burnside–and it’s a good spot for people watching. The pizza was decent for a “by the slice” kind of joint. 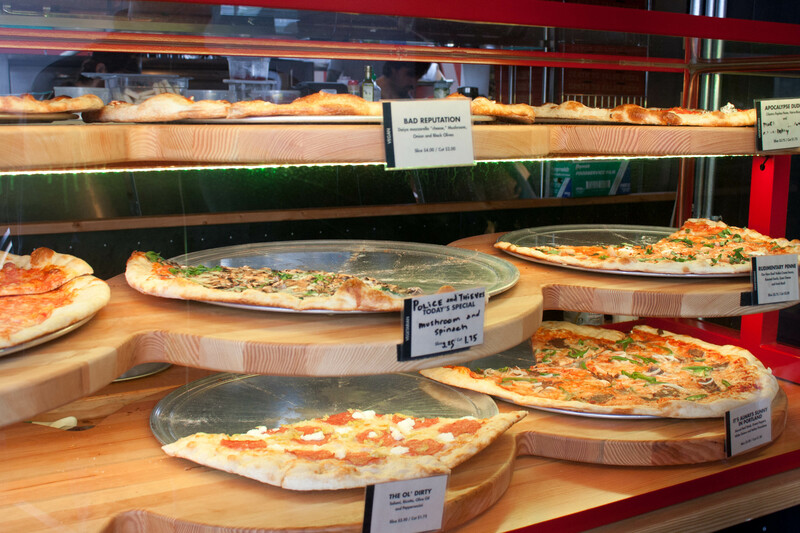 It was no Apizza Scholl’s but it’s a good spot to grab a quick lunch after browsing Powell’s Books for hours. I definitely went over my calories for lunch but it was a nice splurge. It was nice hanging out with Michael for lunch and taking a little break from work, too. It was a nice, sunny day after days of pouring rain and windy weather. I want to hold onto hope that spring is almost here. I am finally seeing some evidence that spring has arrived! Maya Update: Maya went to the vet recently and had her incisions checked from the previous week’s extractions. One has healed completely and another one is still healing. She’s got some more antibiotics to take and is still on wet food. Hopefully she’ll be back on the regular food soon. She’s getting easier to catch and dare I say–she’s actually enjoying it! She often lets me pet her and hold her now without being “squirmy kitty”! 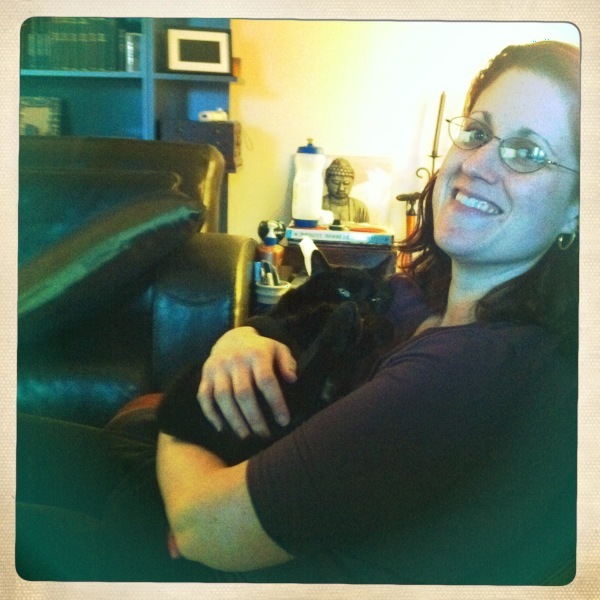 All in all, it was a good day with my man, my kitties and good food. 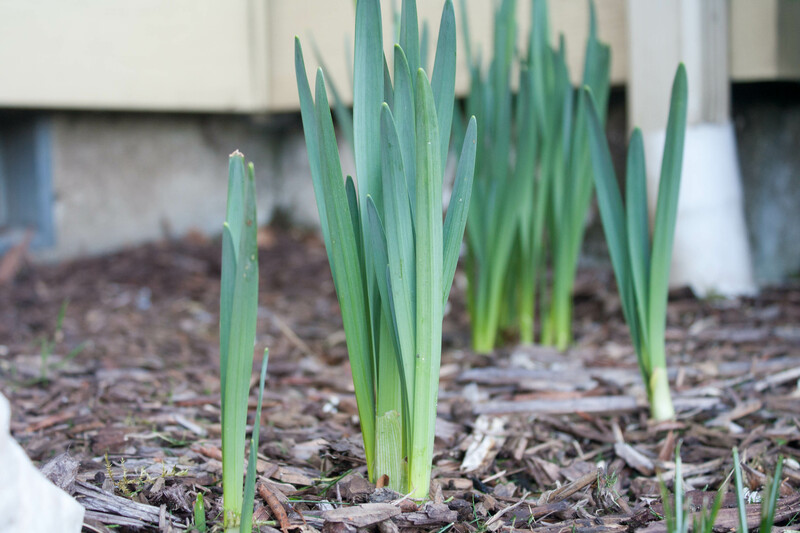 QUESTION: Has spring sprung in your neck of the woods yet? Glad Maya is on the mend!!! Truffle oil is made from mushrooms but it doesn’t taste like mushrooms. I hate mushrooms, so trust me! But it’s really really good! Try it sometime. One word to the wise–a little bit goes a long way. I don’t like mushrooms….. but I will trust you!!! Do you use it for salad dressing and cooking? Jill recently posted..Exercise. My Blessing or my Curse? I was reluctant to try it too, because I hate mushrooms, but it doesn’t taste like mushrooms at all. It’s earthy and good. You can use it on pizza, as salad dressing, cook veggies in it. Yep! She’s doing great. And she’s actually warming up to the socialization. Which is nice for us. I love that you post about local eats! I had no clue there was a restaurant across from Powell’s. I guess I was too focused on the city of books. 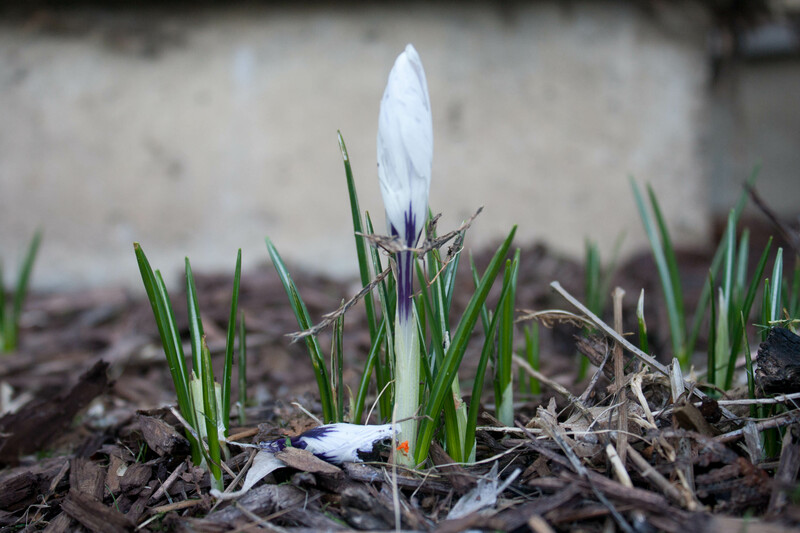 As for Spring… you know the answer to that. Thanks! I appreciate that the local people like the local posts. They don’t get tons of comments because it is a local thing but I think it’s good info.